Your Nintendo DS is not just a gaming device now! 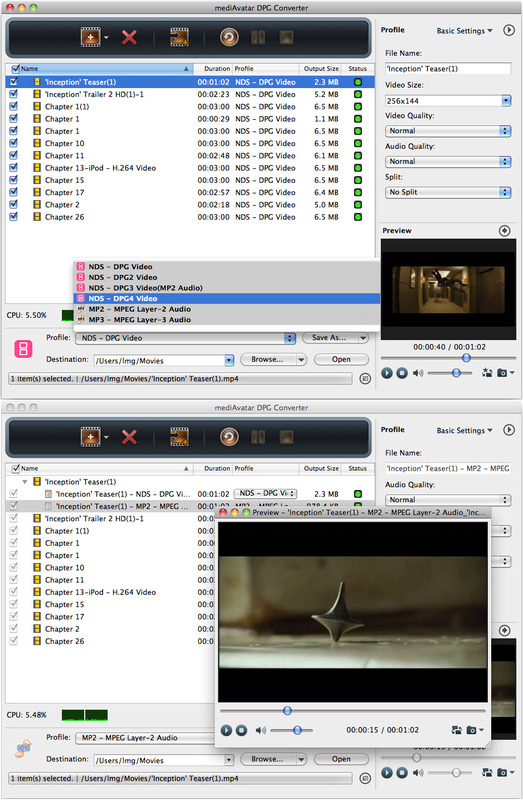 Easily turn it into a portable movie player with this mediAvatar DPG Converter for Mac. Convert almost all format (AVI, MPEG, H.264/AVC, 3GP, VOB, DAT, WMV, MP4, DivX, MOV, RM, ASF, etc.) videos to DPG, DPG2, DPG3, or DPG4 videos, or convert video files to MP3 or MP2 audios, or convert from WMA, WAV, M4A, AAC, AC3, OGG, CUE, APE, and CDA audio formats to NDS supported audio formats. 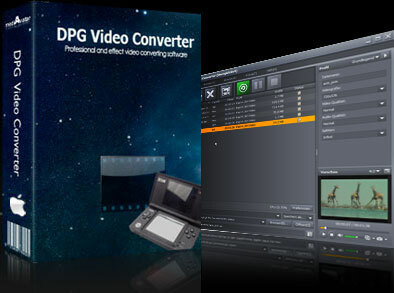 This Mac DPG converter allows adjusting FPS (frames per second) and bit rate, ensuring you clearer and smoother played DPG videos especially converting animations to DPG videos. Download mediAvatar DPG Converter Mac for FREE now. Watching movies on NDS has never been easier! Convert video files to DPG/DPG2/DPG3/DPG4, e.g. convert AVI to DPG, convert MP4 to DPG, convert MPEG, H.264/AVC, 3GP, VOB, DAT, WMV, MP4, DivX, MOV, RM, ASF and many other formats to DPG videos. Just transfer all these videos to your Nintendo DS and DSi XL! Extract music from videos and convert videos to DPG MP3/MP2 audios on Mac; convert audio formats (WMA, WAV, M4A, AAC, AC3, OGG, CUE, APE, CDA, etc.) to MP3/MP2 audios. Now play music on your Nintendo DS anywhere anytime. Convert animations to DPG videos with high-quality FPS on Mac, making the animations to be played smoothly on your Nintendo DS. Set multiple output formats or set different parameters (FPS and bit rate) for the output formats on a single file and convert them at one time to satisfy multiple requirements. Preview video files before convert to DPG in the built-in media player and snap video images you like anytime during preview. Rip and convert DVD movies to different video and audio format files for all popular multimedia devices.